Take a look at the map above. If you can spot tiny Israel at all, dwarfed by all the surrounding lands governed by Muslims, you will see how disproportionate is the opposition to its existence. 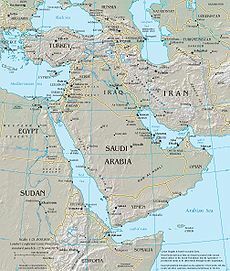 I say “existence” because sometimes Islamic leaders speak of their determination that Israel should be “driven into the sea”, or “wiped off the map” To locate Israel in this map, refer to the one at the bottom. In my country of origin, the United Kingdom, it’s become fashionable to blame all the problems of the Middle East on Israel. Neo-Nazis and other anti-Semites even go so far as claiming that all the political and economic problems of the world are caused by Zionists and Jews. I’ve heard some of them say it myself – perhaps you have too. Anti Semitism did not die with Hitler, it just took a back seat for a time. Believers, take neither Jews nor Christians for your friends (Surah 5:51). Men take authority over women…As for those who are disobedient, admonish them and send them to beds apart and beat them (Surah 4:34). Of course, anti Semitic views are not confined to Muslims or to the United Kingdom – they are worldwide. It’s fashionable for the news media, for colleges and universities, for many politicians, celebrities, and the people on the street to take sides against Israel. The United Nations regularly condemns Israel for defending itself, and wishes to diminish its power in any way possible. I don’t intend to go through the history of Israel, Islam and the Middle East here, except to remind you (or perhaps you’ve never been told) that Israel was last removed from its land by the legions of the Roman Empire under Titus, in the first century AD. Josephus estimated that the Romans killed over one million people in the process, ploughing Jerusalem into the ground, and then renaming the land “Palestina” as a final insult to the Jewish race, since Israel’s nearby enemies for centuries had included the Philistines. There has never been a nation called “Palestine”, and no other nation has had Jerusalem as its capital except Israel. Israelites wandered the earth since the first century, being hounded and persecuted wherever they went. The last significant persecutions, perpetrated by Hitler and Stalin, caused Israelites to seek their own homeland after WWII, in the hope of avoiding any future genocidal attempts against them. Fulfilling Bible prophecies, they founded the new nation of Israel, and have been growing in population and economic success. People of Jewish descent have been moving into the land from all over the world. The terrible history of the Jewish nation, struggling for its very survival, as well as its future, was prophecied well before and during the time of Christ. In fact, the Bible speaks clearly of events still to come which will affect the whole world, centred in the nation of Israel. The current “peace process” calls for the division of Jerusalem, and for Israel to become even smaller, so that it would be shrunk to nine miles wide at its narrowest point, and fifty at its widest. A space this small would be impossible to defend agoinst the many surrounding nations committed to Israel’s destrution. Islam now (and not in the past) claims that Jerusalem and the land “occupied” by Israel belongs to them. Jerusalem was not mentioned once in the Koran, but is mentioned 800 times in the Bible. Jews established Jerusalem as their capital three thousand years ago. This opposition has been prophecied in the Bible. Not only so , but the Bible speaks of a time, just before the return of Christ to the earth, when Israel’s neighbors, with the help of “all nations of the earth” will make one last almighty effort to remove the Jewish state, particularly Jerusalem and Judah, currently known as the West Bank. The number of similarities between Bible prophecy about Israel in the “Last Days”, and the current situation in the Middle East, along with world wide anti-Semitism, is amazing. You can see some of the details below. Please understand that I am not saying that all Israelis are good and all Moslems are evil. Many Moslems are good people, and many have found faith in Christ, despite the threat of persecution from radicals among their own people. Many Israelis are ungodly people, and the judgments of the Last Days are aimed at them as much as anyone. I will gather all nations to Jerusalem to fight against it…Half of the city will go into exile, but the rest of the people will not be taken from the city. Then the Lord will go out and fight against those nations, as he fights in the day of battle. On that day his feet will stand on the Mount of Olives…(Zechariah 14: 2-4). Multitudes, multitudes in the valley of decision! For the day of the Lord is near in the valley of decision. The sun and moon will be darkened, and the stars no longer shine. The Lord will roar from Zion and thunder from Jerusalem, the earth and sky will tremble. But the Lord will be a refuge for his people, a stronghold for the people of Israel (Joel 3:14-16). In those days and at that time, when I restore the fortunes of Judah and Jerusalem, I will gather all nations and bring them down to the valley of Jehoshaphat. There I will enter into judgment against them concerning my inheritance, my people Israel, for they scattered my people among the nations and divided up my land (Joel 3:1-2). Notice the words “my land” in that last verse. The land belongs to God, and he can lease it out to whoever He wants. Notice also the words “my people”. Zechariah 12, verses 2, 6 and 7.